Groups from both sides of the aisle are making major SCOTUS-related ad buys. President Trump will announce his nominee for the next U.S. Supreme Court Justice this Monday and already outside groups from both sides of the political aisle are committing millions of dollars in advertisements surrounding what is expected to be a lengthy and rancorous confirmation battle. I will be making my choice for Justice of the United States Supreme Court on the first Monday after the July 4th Holiday, July 9th! Two groups, the conservative Judicial Crisis Network and the liberal Demand Justice, have both pledged over $1 million in their respective fights to either encourage support or encourage opposition to whoever emerges as Trump's nominee to replace Justice Anthony Kennedy, who announced his retirement from the bench last week after over 30 years of service. 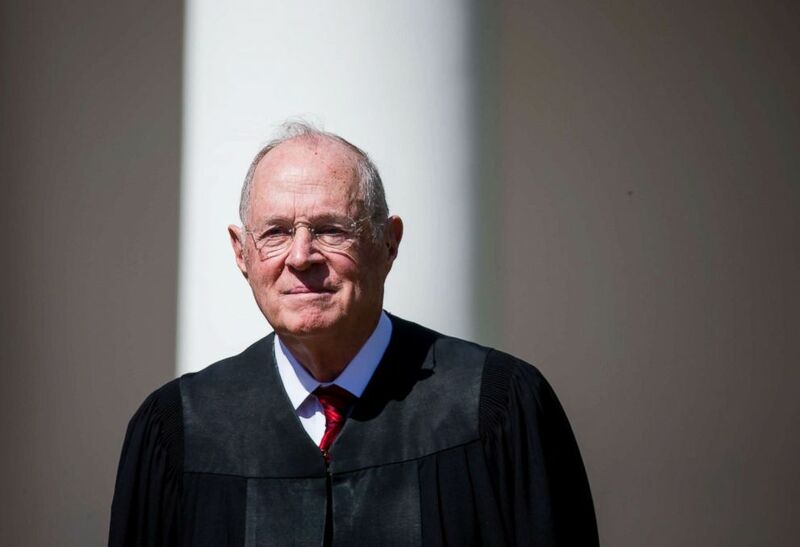 (Eric Thayer/Getty Images, FILE) Supreme Court Associate Justice Anthony Kennedy attends a ceremony in the Rose Garden at the White House, April 10, 2017 in Washington, D.C.
Liberal groups have shown a particular focus on healthcare and abortion rights as key issues related to the President Trump's appointment, and many are indicating that whoever he appoints will overturn the Court's landmark 1973 ruling in Roe v. Wade. Judicial Crisis Network's ad is part of a seven-figure national cable and digital campaign, and praises Trump's list of 25 potential nominees for the court, before going on to decry "extremist" Democrats who they claim will "lie and attack" the President's eventual nominee. "Don't be fooled, President Trump's list includes the best of the best, and with your help, America will get another star on the Supreme Court," the ad continues. According to the organization's chief counsel and policy director, Carrie Severino, the group spent a combined $17 million to both block Merrick Garland, President Obama's nominee in 2016 to replace Justice Antonin Scalia, and later to boost President Trump's nominee for the spot, Neil Gorsuch, who was confirmed in April 2017. "They are fair and independent judges with records of listening to the arguments of both sides in the courtroom, delivering well-reasoned decisions, fairly applying the law and honoring the Constitution," Severino said of Trump's list of potential nominees in a statement last week, "Like Justice Gorsuch, each one of them has the wisdom and experience necessary to sit on the Supreme Court from Day One. We look forward to President Trump nominating another great justice." 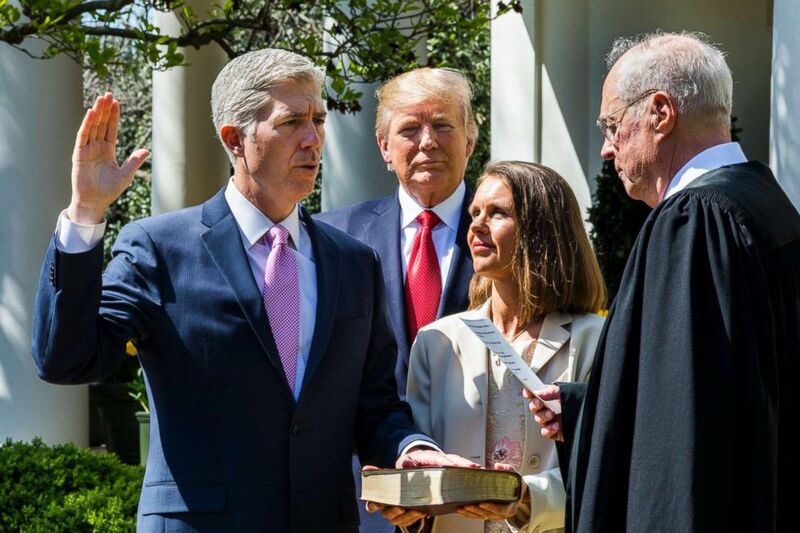 (Jim Lo Scalzo/EPA, FILE) Justice Anthony M. Kennedy, right, administers the judicial oath to the US Supreme Court's newest member, Neil M. Gorsuch. The conservative group One Nation ran a $100,000 issue advocacy digital ad campaign targeting the 10 states President Trump won in the 2016 elections where Democratic senators are up for re-election in 2018: Florida, Indiana, Michigan, Missouri, Montana, North Dakota, Ohio, Pennsylvania, Wisconsin and West Virginia. The group does not have any plans to roll out additional ad campaigns this week, but that could change following President Trump's Monday announcement of his nominee, according to Chris Pack, the communications director for One Nation and other Republican Super PACs such as Senate Leadership Fund and American Crossroads, both of which have links to Senate Majority Leader Mitch McConnell, R-Ky. According to a report by Politico, Demand Justice, which was already running ads on social media in early June attacking Trump's potential Supreme Court nominees, is launching a $5 million radio, television, digital and voter mobilization campaign in Alaska and Maine, home to two moderate Republican senators who will be key votes in the coming confirmation process: Susan Collins and Lisa Murkowski. The group is also launching ads following Trump's Monday announcement in Indiana, North Dakota and West Virginia, states represented by three moderate Democratic senators that voted to confirm Gorsuch: Joe Donnelly, Heidi Heitkamp and Joe Manchin. "Our courts should be the place that we can trust to safeguard our rights and promote justice," the group's website reads, "But in Donald Trump’s America, our justice system is being corrupted to serve corporate interests and impose a far-right, social agenda on our everyday lives." The group received support on Twitter last week from 2016 Democratic presidential nominee Hillary Clinton, who said she "excited to support" their campaign. Protect our Care and NARAL Pro-Choice, two other liberal groups, have each released digital ads this week focusing on protecting the Affordable Care Act and upholding Roe. v. Wade respectively. Protect our Care is running healthcare-focused ads in Alaska, Maine and Washington, D.C., and plans to expand their buy to more states at a later date. "If you want to preserve protections for people with pre-existing conditions, and you want to protect and improve upon the Affordable Care Act, then you cannot let the Trump Administration have free reign to install a radical Supreme Court Justice who will do just that," said Brad Woodhouse, the executive director of Protect Our Care. "They know that they will not get a Justice nominated if the American people know this is what they want to do," NARAL Pro-Choice America President Ilyse Hogue said in a press call over the weekend, "What we need to know, is that anyone coming onto the Supreme Court is going to uphold the law of the land and particularly a woman’s right to decide what happens to her own body." NARAL is also running a full page ad in all major Maine newspapers, and digital ads specifically targeting Collins. The ads will start running in the state Wednesday, according to Amanda Thayer, the group's press secretary. A Quinnipiac University poll released Monday found that 63 percent of Americans agree with the Supreme Court's decision in Roe v. Wade. The Supreme Court vacancy has also roiled key Senate campaigns across the country, and candidates from both parties are hoping the issue motivates voters ahead of the Fall, even if the nominee is confirmed before the midterms. (Win McNamee/Getty Images, FILE) Sen. Claire McCaskill questions Secretary of Defense James Mattis about a new report detailing procurement violations involving a defense contractor at a hearing held by the Senate Armed Services Committee, April 26, 2018, in Washington. Missouri Republican Senate candidate Josh Hawley has launched a website highlighting the voting record on judicial nominees of his opponent, Democratic Sen. Claire McCaskill. 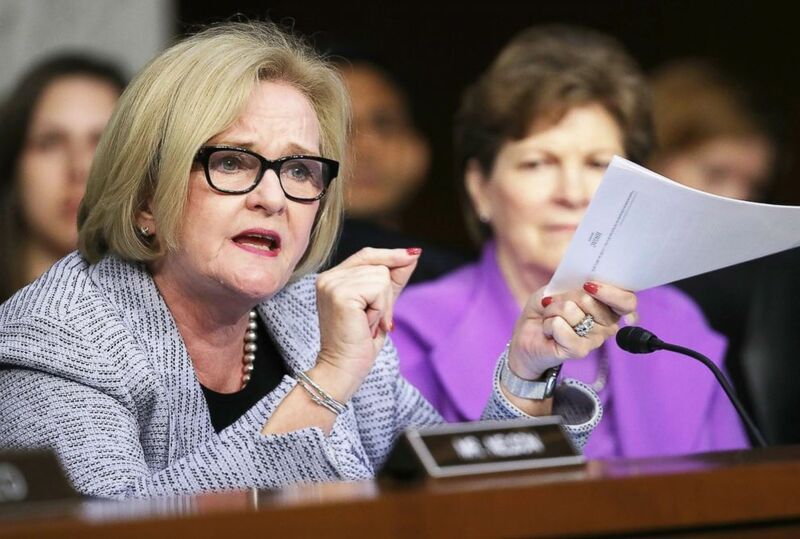 McCaskill told the Associated Press last week that it is "premature to discuss" a replacement for Kennedy until one is nominated.